The M-S Cash Drawer J-423 Smart Series has the versatility and space-saving design essential for installation in most point of sale stations. 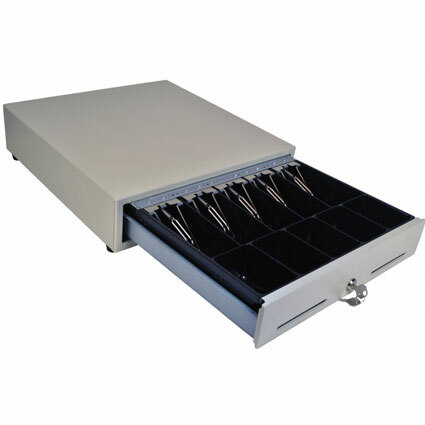 The drawer can receive an open signal via receipt printer, RS-232 serial, parallel, or USB interfaces, allowing it to work seamlessly in virtually any location. The 15.9" x 16.7" x 3.86" all-steel body weighs approximately 20 lbs, giving you a small form factor with durability necessary to resist the traumas of daily use. Available in black or white, the M-S Cash Drawer J-423 has what it takes to succeed. Dimensions (WxDxH): 15.9" x 16.7" x 3.86"